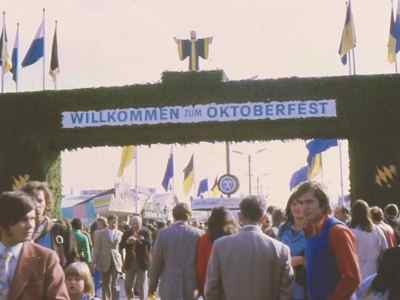 It’s been a few years since we went to Oktoberfest, but when fall rolls around we always think about it. And one thing you should know is that it's a Fall festival... not an October festival. He almost always goes…for the nostalgia and for the beer, and he almost always tries to coax us to join him. The event is so famous that that communities in the U.S. and elsewhere have fashioned fall festivals after it. Have you ever thought about going? It’s Munich's combination Bavarian beer festival and fair. Yes, there’s lots of beer. Lots of food too. It's all about the beer, of course, but there are all kinds of festivities and activities that go on for the duration of the event. It takes place on a big fairground in Munich, and just like a county fair at home, there are all kinds of carnival rides. Are you planning a trip for October? Well, wait a minute! You're going to miss it, or most of it. It starts the third Saturday in September and is over by early October. The festival lasts for 16-18 days. 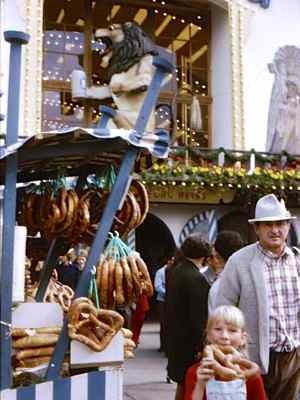 The first time we went to Oktoberfest, we learned that first hand. Way back them, we were young and in Munich, just touring... and the host at our B&B told us that there were no rooms available from the weekend on for the next several days. It was the middle of September.... and Oktoberfest was about to begin. ...So we got to see all of the beer carts with their big draft horses from the first floor above the fray. On the first day, it starts with a colorful parade through town to the fairgrounds, the Theresienwiese (called the Wies'n for short). 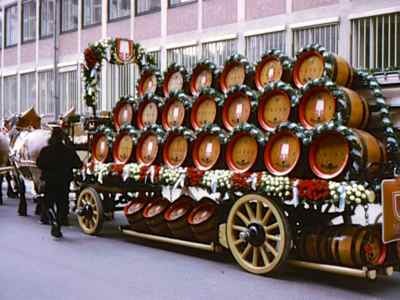 The Wiesenwirten (the breweries) have oompah bands and horse drawn carts piled high with beer barrels. 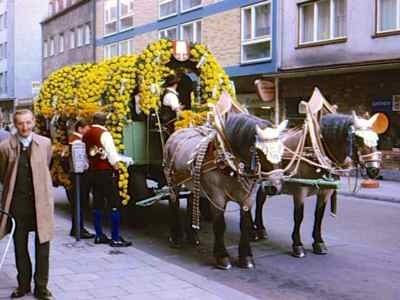 The beer wagons and the draft horses are decorated, and there are lots of people marching and dancing along in traditional clothes. If you're lucky enough to be there on opening day, dance along behind the parade and follow them to the Wies'n just like we did. We followed the oompah bands into the Theresienwiese fairgrounds and got our first taste of the raucous festivities that are what Oktoberfest is all about. It originated as a wedding feast fit for a prince in 1810, and apparently they had so much fun that it just kept going. It's free to get into the Wies'n grounds, you pay for food and rides as you go... and of course the beer. There are about fourteen big beer tents set up by the breweries. You can choose your tent by beer preference if you like; we've always just chosen a tent where we were lucky enough to get a seat! It's harder to get a seat the later you arrive. Many tables are reserved. Don't sit there, but don't be shy, do squeeze in where you can and get friendly. Here’s the deal… In order to be served a beer at Oktoberfest, you must be seated. Don't worry if you can't get into a beer tent. Each of them has tables outside, and it can be easier to get a seat there. And loud as they are, you can probably hear the bands from outside. Oktoberfest beer is potent stuff. 8 percent alcohol. AND it comes in those LITER mugs. Be sure to take plenty of cash, those beer toting beer maids don't want to stop to swipe your credit card! There are ATMs at the Weis'n, but the lines could be long. Drinking all that beer, you'll want to find a toilet. Americans want to look for "restrooms", but you need to look for "WC" or "toiletten". If you have a seat, make sure you leave a friend behind to keep it reserved for you. If you leave a tent, it might be hard to get back in. Reserve your room well in advance. Rooms will be more expensive during the festival and hard to get. The last time we went, we did have friends in Munich find us a room at the last minute... so it is possible, but expect to pay dearly if you reserve at the last minute like that. Getting to the fairgrounds is easy.... There is public transportation. It's right behind the Hauptbahnhof (the central train station). Just follow the crowds! Most of the beer tents open at 10:30 in the morning... a little early to start drinking, but you might want to grab a seat. They close at 11:00 pm or midnight, but they stop serving beer earlier than that.... It takes a while to drink that whole liter! If you stay until closing time, it is a mass exodus to the subway (U-Bahn or S-Bahn).... but the crowd is mostly friendly drunks.